Emily Jungmin Yoon is a Korean Canadian poet who wrestles with history. Her debut full-length poetry collection, A Cruelty Special to Our Species, is available on September 18th and explores the history of Korean “comfort women” during World War II. Through different perspectives and voices, Yoon documents the painful—and often silenced—stories of comfort women, or the “women who were forced into sexual labor” by Japanese soldiers occupying Korea. The writing in A Cruelty Special to our Species discusses sexual violence as a tool of war, but by the end of the book, you find that Yoon’s depiction of violence extends beyond that. She also looks at how trauma from past generations can inhabit a person, and stay with them forever. Yoon previously published an award-winning poetry chapbook, Ordinary Misfortunes, in 2017. Her work has appeared in the New Yorker, Poetry, and The New York Times Magazine, among other places. During our conversation, we discussed a range of anticipated and unexpected topics—everything from her writing technique and poetic explorations of war, to humor and K-pop. HelloGiggles (HG): I noticed that you drew from the oral histories of comfort women. What led you to start writing this book of poetry? Emily Jungmin Yoon (EJY): It’s a long story, but when I moved to Canada from Korea, I realized a lot of people don’t know much about this history. Even when people talk about World War II, they don’t know the context of the war, besides the bombing of Pearl Harbor or Nagasaki and Hiroshima. So, I’d talk about World War II, the Korean War, or the colonial period, and people had no idea what I was talking about. I started doing more research. I was interested in the gendered violence of wars. Those stories are often in the margins of war narratives: It’s not just men in battles, bombs, and guns, but these women heavily involved in war by force, as forced sexual laborers. I started writing poetry because that’s the medium that I feel comfortable with. I was talking about stories that mattered to me. I started incorporating them into my writing. It became more about violence against women and women’s bodies in various narratives. Not just about comfort women. HG: The poem at the end of A Cruelty Special to Our Species, “Time, in Whales” is one of the poems to explore violence differently. It focuses on accumulated plastic in the oceans, and what that does to whales, not just to humans. How did that poem connect to the rest of the book? EJY: I guess it’s an extension from my meditations on what we do as human beings. The violences that we inflict on other bodies, on animal bodies, on plant bodies. People are aware that we’re ruining the environment; we’re ruining our home, Earth. I wanted to give more attention to that. My scope had been focused on Korean women, but it started expanding. “Time, in Whales” also talks about my partner, who is a Korean adoptee that came to the United States as a baby. I was thinking about his history, about migration, about various oceans, and the ways that could be explored. HG: Memory comes up in many ways when the poems discuss war and violence. I thought about how people in the United States often seem to forget war, always imagining it to be happening elsewhere. EJY: It’s like how Koreans forgot their participation in the Vietnam War. This kind of habitual, intentional forgetting—but if you’re pushing a memory away, you’re thinking about it. It’s not like you forgot or have amnesia. You’re actively trying to suppress memory. It’s one of the poet’s jobs to bring memories up, put them at the forefront, and materialize them. HG: Your poems in the book play with etymology, or the origin of words. Can you talk about how the history of language pops up in these poems? EJY: I think, in a way, it’s because of my status as a bilingual person. When I first started learning English, I learned that there are Latin roots for a lot of words, and that interested me…that there are words within words. Being interested in how every word has its own story helped me pick up English faster. When I became fluent in English, I considered how I’d never really thought about the meanings or origins of Korean words, so when I thought about them, I realized that I could write poems about every word having a story or a history. I started incorporating those thoughts into my poetry and started putting Korean into my poems. I know lot of writers who use words from other languages in their writing don’t italicize them because they “don’t want to foreign-ize them.” I realize that I continue to use italics—which some writers of color don’t agree with. When words are italicized in English text, it brings attention to its difference, and that’s what a lot of people are fighting against. But I think I conceptualize it a little bit differently: My titles are italicized. My inner thoughts are italicized. I like how it visually catches attention. So I don’t want to exoticize Korean language in my poems when I italicize. I just want to draw attention to those words. HG: How do you think immigrating from Korea to Canada and the United States shaped you as a writer? EJY: It’s hard to say how each culture or country has influenced me or my poetry. I’ve been writing for as long as I can remember. The poetry that I’m writing now is heavily influenced by American politics and what we live through here. I learned a lot when I was doing my MFA at NYU. My friends and I would discuss our cultural history through poetry. We’d merge activism with poetry. So the education that I got from my peers there—going to readings, talking to other poets who came through New York—changed my ideas of what poetry should do. HG: Can you talk about how you master this art form? How do you find your voice? EJY: It’s creating space. As poets of color, the burden is greater. Your poetry is seen as ethnography, or tied to suffering, history, or immigration—all these heavy issues. Asian American poetry is oftentimes only read as literature about race—like it can’t be about anything else. Or attention is only on the formal qualities. We’re still learning how to talk about poems by poets of color in a way that does justice to the art. HG: We’ve been taught to believe that poems should be traumatic, and they don’t have to be. EJY: I want to think about how can we use humor as a tool to talk about real problems. I want to learn how to weaponize humor. Humor can be strategic. It’s a way to deliver a message to people through laughter. People are immediately more open to ideas when they’re laughing. HG: On that note, are there any comedians that you really like? EJY: Yes, Key & Peele for the social commentary. I’m interested in Jordan Peele’s new horror movie, Us. HG: Comedians model storytelling and timing, which are so important in poetry. EJY: I watch hours of stand-up for research. And that’s what poets of color are doing—expanding the boundaries of what poetry can do. There are also slam poets who challenge what poetic voice should sound like and what vocabulary is permitted in poetry. I believe poets of color are changing what it means to be a poet. HG: Is there one non-literary thing about yourself that you’d like to share? EJY: I love karaoke and kitschy K-pop songs. People have criticisms about popular music in Korea, like “it’s so repetitive,” but karaoke is where I go to not intellectualize things. It’s not like I have nothing to say about problematic things in K-pop, but I enjoy karaoke. And it’s better when soju is involved. 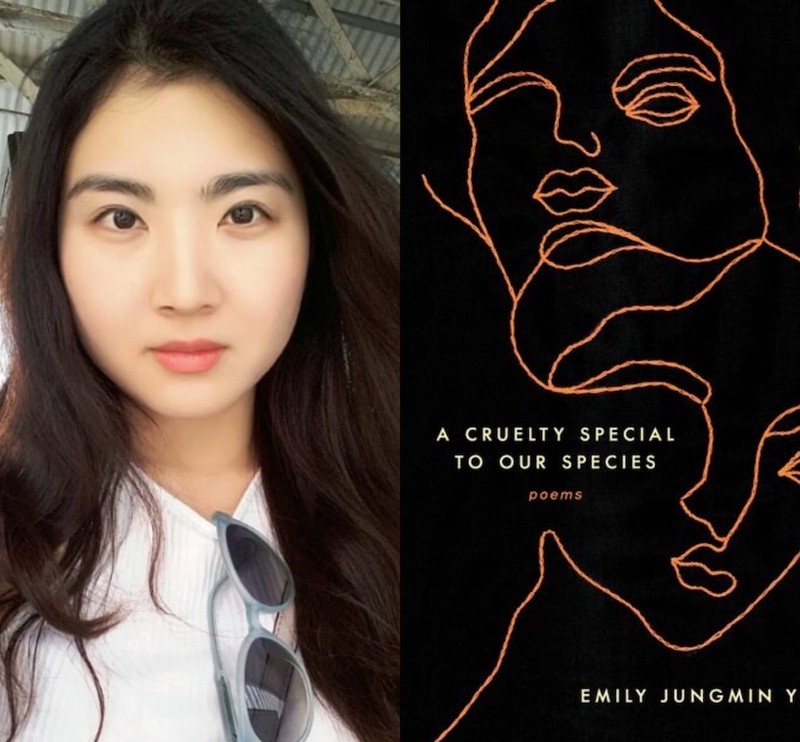 The post Poet Emily Jungmin Yoon talks writing her new book and using poetry to keep forgotten history alive appeared first on HelloGiggles.